He Said, She Said, They Said: What’s the Final Verdict on the Wildly Popular Flow Hive? While many established beekeepers were resistant to these new-fangled Australian hives, they're likely coming to a farm, backyard, or rooftop near you soon. 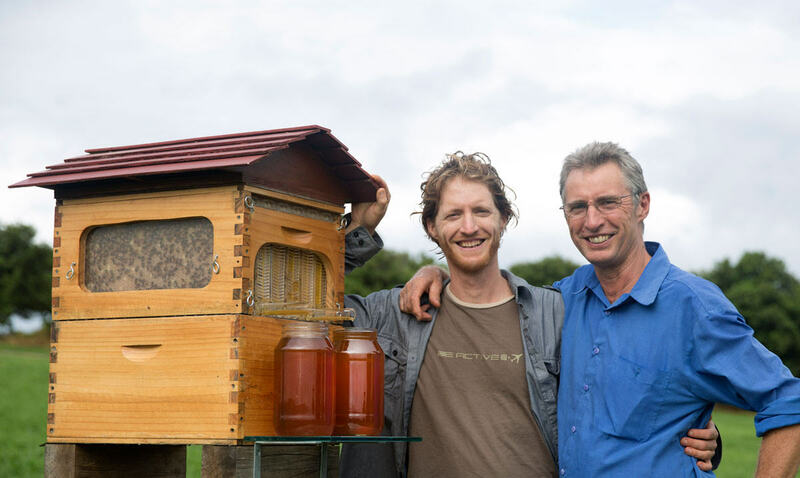 Cedar (left) and Stuart Anderson with their invention, the Flow Hive near Byron Bay, Australia. On their website, the Flow Hive had been advertised by their inventors to provide honey “on tap” in a way that was “less stressful for the bees” than traditional methods. Designed with parts that could be incorporated into a conventional stacked Langstroth hive, it includes plastic frames that – with the insertion of a giant-sized Allen wrench – can be shifted to extract honey through special tubing. For a while last February, the Flow Hive enjoyed unprecedented celebrity across the Internet thanks to a video, designed to promote the new invention and raise money for its development, that went viral, racking up more than two million views on YouTube. Some beekeepers worried that the Flow Hive would promote sloppy beekeeping and encourage bee-health problems at a time when bees are experiencing tremendous declines. Others were offended by promotions for the Flow Hive, feeling they depicted honey harvesting as disrespectful and antagonistic to the bees. Many wondered if the new plastic frame-splitting design would be unhealthy for the bees, crush worker bees as they filled honeycomb cells, or kill the babies, known as brood. On the blog Root Simple, author Erik Knutzen called the Flow Hive a “solution in search of a problem” and admonished its inventors for encouraging an exploitive relationship with bees. He expressed concerns that the new hive might encourage a sort of greediness among new beekeepers. It didn’t help that the Flow Hive company’s Indiegogo fundraising campaign had broken records by making $12.2 million dollars in just three months. At beekeeping events around the country, even beekeepers who didn’t have strong feelings about the new hive design questioned why a company that originally sought $70,000 for design development needed that much cash. Critics complained that the money might be better used on academic bee research. Even beekeepers who didn’t have strong feelings about the new hive design questioned why a company that originally sought $70,000 for design development needed that much cash. In the beginning, writer Rusty Burlew was among the skeptics. As a beekeeping instructor, columnist for the British Beekeepers Association magazine Bee Craft, and the executive director of the Native Bee Conservancy, she’s become well known for her sometimes caustic opinions on beekeeping trends and fads. So when the Flow Hive video went viral, friends and family kept sending her links, asking what she thought of it. She wanted to ignore the whole thing, but after a while couldn’t resist checking it out. “In the early days especially, the Flow was marketed as a way to harvest honey without harming the bees, or bothering the bees, or the killing the bees, or even dealing with bees,” Burlew says via email. “The idea they conveyed was you just bought this thing, put the bees inside, and then turned the crank when you wanted honey.” She was not impressed, and wrote posts on her blog Honey Bee Suite saying so, here and here. Bees demand a beekeeper’s vigilance and a certain time commitment in order to thrive in the current US environment. Leaving them to fight off new pathogens and pests on their own, it’s argued, would be akin to getting a new puppy and not feeding or house-training it. Cedar Anderson, one of the inventors of the Flow Hive, says he heard this feedback loud and clear within a day or so of going public, and immediately changed how the product was marketed on the website. He hadn’t meant for his invention to encourage anyone to be irresponsible. “I put up stuff saying that all we’re going to change is the honey harvesting, and all the rest of the beekeeping stays the same,” he says in a phone interview. “You’ll still need to look out for your bees as you always have had, and you’ll still need to check for disease; you’ll still get stung by your bees.” Anderson’s also been urging people to join their local beekeeping clubs to educated and has started producing a series of instructional videos for new beekeepers, which should be up on his website sometime in the coming year. 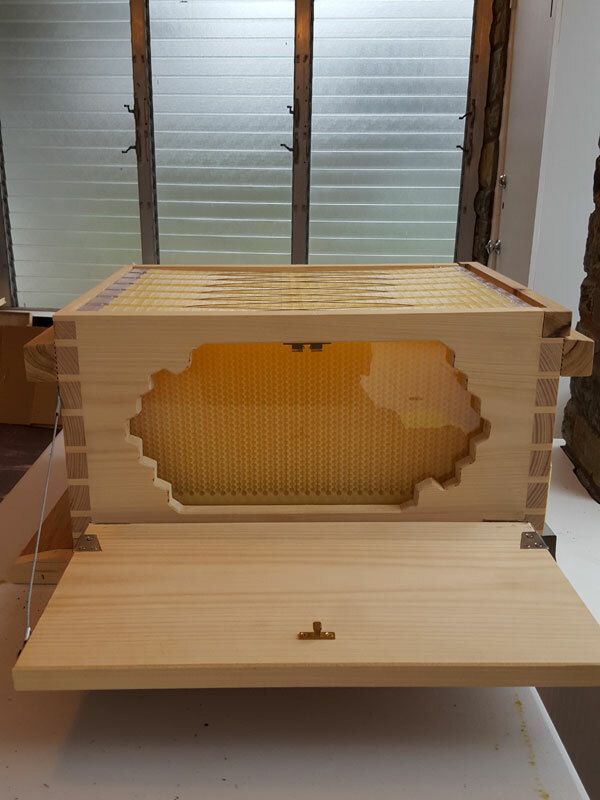 That response has helped to soften some of the criticism; Burlew, for example, says she now thinks of the Flow Hive as simply an expensive device for collecting honey, not unlike several other add-ons currently on the market for Langstroth-style supers and hives. 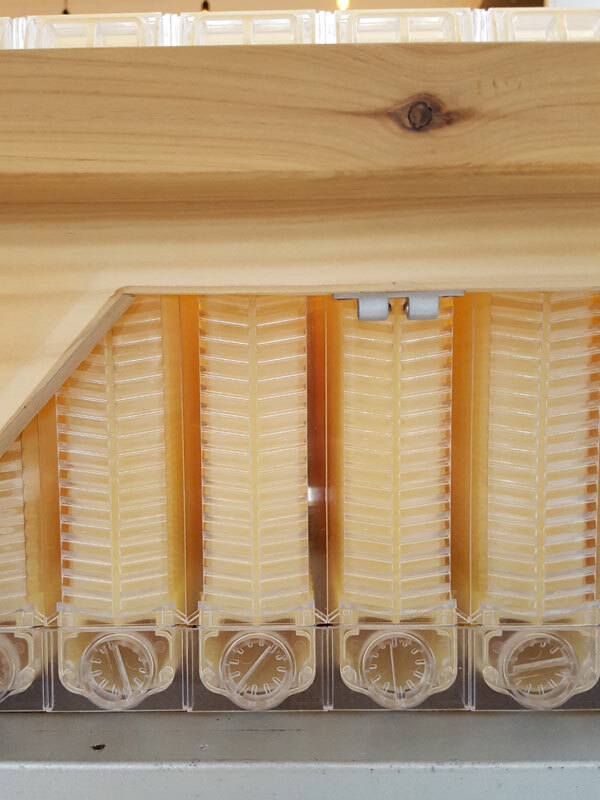 Although he hasn’t seen it in action yet, University of Maryland’s Dennis VanEnglesdorp thinks that the Flow Hive could be a great thing, if it works as promised. VanEnglesdorp was one of the first researchers to identify and document Colony Collapse Disorder ten years ago, and has worked extensively on honeybee health in the years since. Back in D.C., Jason Allen-Rouman has decided he no longer has to go “underground” with his Flow Hive. 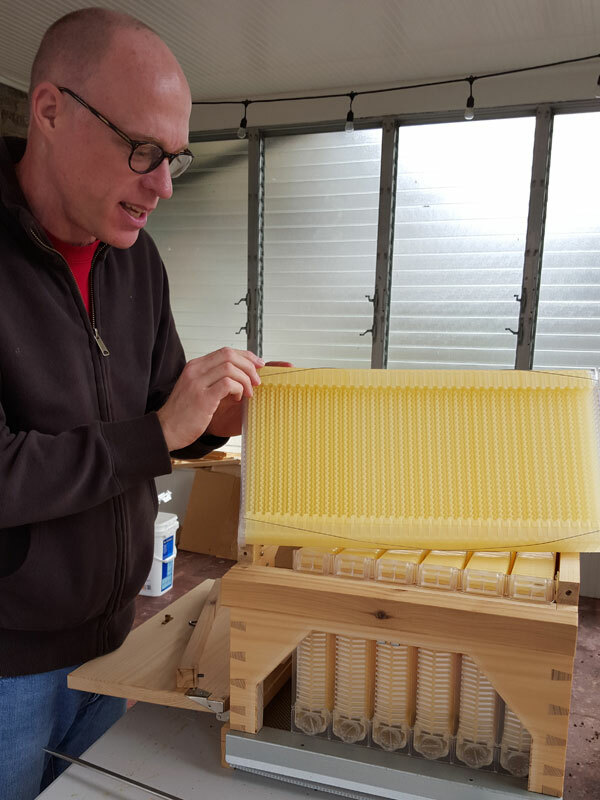 His first package of bees, installed in a conventional Langstroth hive last April, is doing well, and he’s hopeful they’ll make it through the winter and that he’ll be able to incorporate the Flow Hive into the set-up next spring. He’s gotten some shouts of support from a Facebook group calling itself the “Flow Hive Optimists,” and the president of the DC Beekeepers Alliance recently stopped by, eager to get a close up look at the new invention. Allen-Rouman likens his experience to that of any early adopter; he thinks there will be some problems that may emerge as the Flow Hives get put into use, and the company will have to address those and keep improving their design, their marketing, and their product. But really, he asks, is that different from those working with any other kind of technology?